I recently was fortunate enough to spend some time in Croatia. The country is beyond beautiful and the food is absolutely amazing. While I was there, I naturally decided that I would need do “research” and therefore ate everything I could get my hands on. Stomach – 1, Pants – 0. One of the best things that I ate (literally every day) was Calamari. When cooked correctly, it is one of my favorite foods. 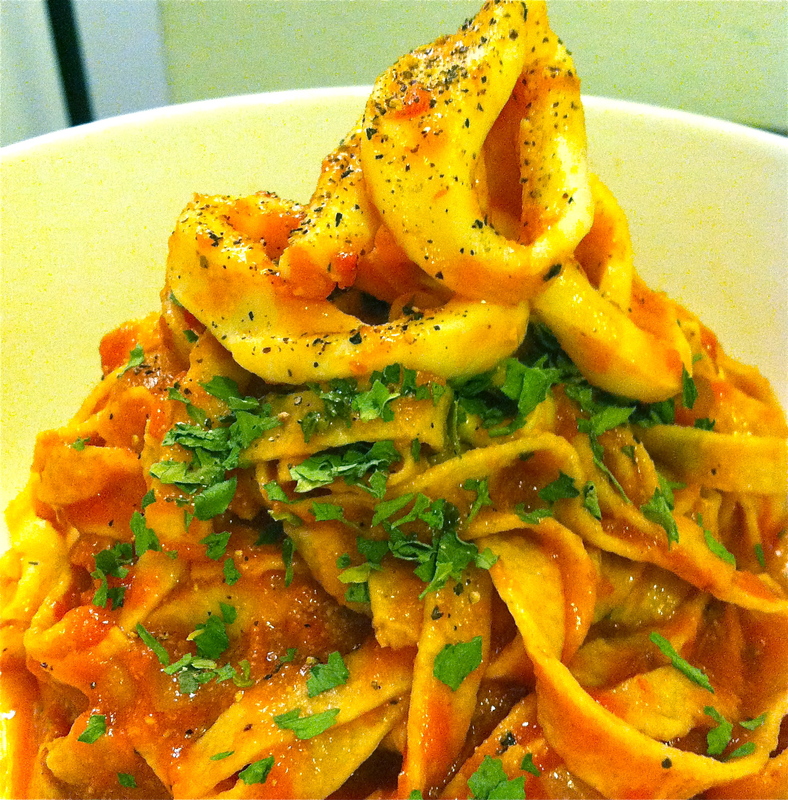 This dish highlights the great flavor of Calamari with fresh pasta and a spicy tomato sauce. In a large pot, heat 2 Tbsp of Olive Oil. Mince the Garlic and chop the Onion and saute until the Garlic browns slightly and the Onions begin to become translucent. Add the Crushed Tomatoes, Tomato Paste and Water to the pot. Add the Bay Leaf and Salt and Pepper to taste. Let the Sauce cook for about 45 minutes and add the Crushed Red Pepper to taste. In a medium frying pan, heat the remaining 2 Tbsp. of Olive Oil. Slice the Calamari into rings. Add the Calamari to the Olive Oil and saute for 2 minutes, adding Salt and Pepper to taste. Cook the Fresh Pasta as directed, then mix with the sauce (start by adding a little sauce to the pasta at a time, you don’t want to drown your pasta in sauce). Add the Calamari and Fresh Parsley to the top of each serving and enjoy!